Yippie! It’s Friday, it’s Friday! I’m doing the happy dance!! Since it’s Friday and Friday’s seem to be the day of the week, where you have pizza, tacos or some fun dish to reward ourselves for making it through the work week. I thought it would be fun to share with you one of my all time favorite snacks, that is so easy to make! Ahh Nachos! I love nachos! I swear if you put a pile of nachos or any of the nacho condiments in front of me, I could just eat, eat, eat until there is no more left!! Since I have no nacho control, I thought I should find a way to scale the recipe down a bit so I could still enjoy my favorite treat and not worry about all the calories and fat I’m consuming. 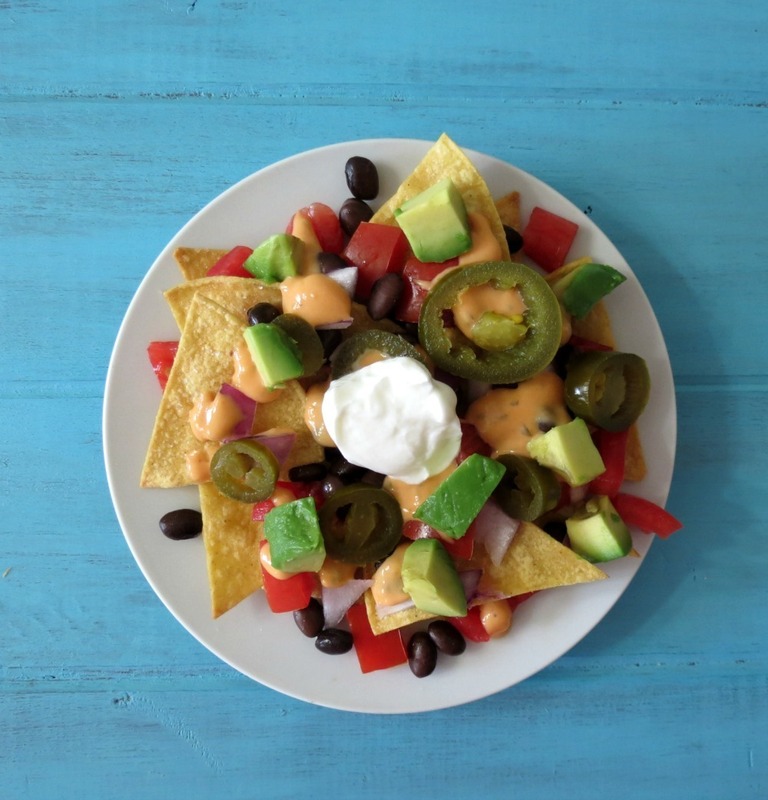 If you order nachos from a restaurant you’re looking at 100’s to 1000’s of calories. Yes they are good, but regret hits later when you realize you consumed about 4 servings of this tasty dish. Dam you nachos for being so good!! The first thing I did was make my own tortilla chips. I took Mission brand thin corn tortilla shells which are 40 calories each and cut them up into 8 triangles. I baked them in the broiler for a few minutes. You have to be carful when making them because they burn pretty quick. I burned my first batch. One other thing about these chips, you must eat them right away or they will turn out a bit chewy, so eat them up!! Or if you could always use your favorite tortilla chips! I didn’t have any on hand so I made my own!! Once I took the chips out of the oven the fun part began! I started to layer it with my favorite goodies, like black beans, tomatoes, onions, Con Queso Cheese. 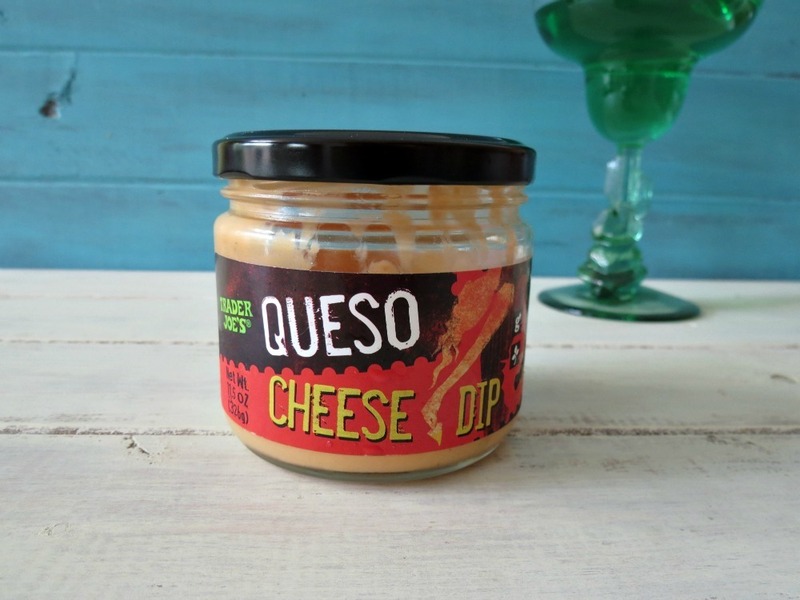 I’m telling you, when and if you go to Trader Joe’s get their Queso Cheese Dip! It’s only 15 calories per 2 tablespoons and the stuff is amazing! I love it and put it on my tacos, dip pretzels into it and even drizzle it over some of my vegetables. I just love the stuff. It’s located in the isle with the potato chips. Then my last layer is the jalapeno’s, greek yogurt and avocado! Yum! I’m writing this at 7 in the morning and now all I’m going to think about all day, is nachos. Needless to say, I think I’ll be snacking on this today!! Look at all this goodness! Besides that it tastes so darn good, it’s also low in calories. This whole serving is only 152 calories and contain almost 5 grams of fiber and 5 grams of protein. Now those are nice stats for nachos!! I have to pat myself on the shoulder for this recipe!! 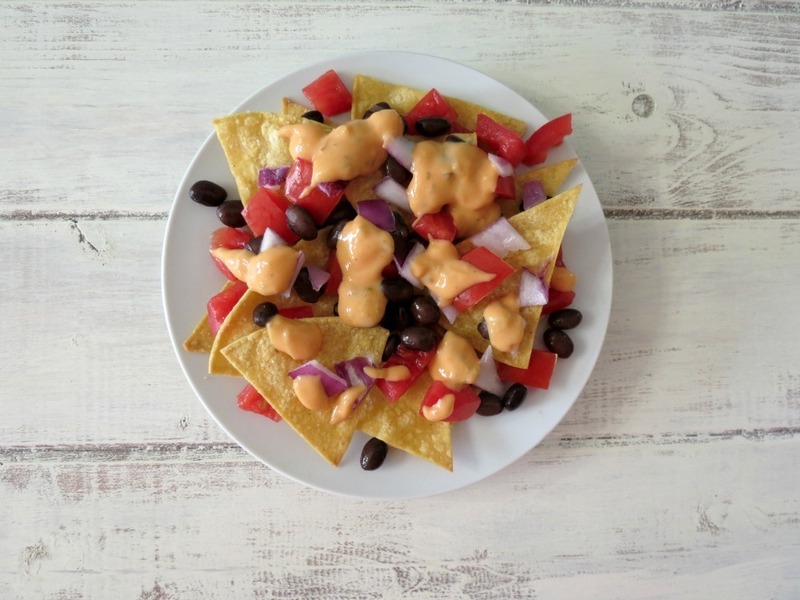 A traditional Mexican side dish made with homemade tortilla chips and topped with cheese, black beans, tomatoes and onions. Preheat your broiler on high. Line a baking sheet with parchment paper. Cut your tortilla shells into 6 slices per shell. Place shells on baking sheet and lightly spray with cooking spray. Flip shells and lightly spray with cooking spray and sprinkle with salt. Place in broiler on bottom shelf and cook for 2 minutes. Flip the chips, and cook for 2 more minutes or until crispy. Watch so they don't burn. Place cooked tortilla shells on plate and layer with black beans, tomato and onions. I make sure to put ingredients underneath the chips too. Then add cheese, jalapenos. avocado and add a dollop of greek yogurt. Have a super fabulous weekend! Thank you for another amazing recipe! I love nachos too and I’ve really been in the mood for them lately, so this is perfect. I love nachos but never eat them because they’re so high in calories and fat. 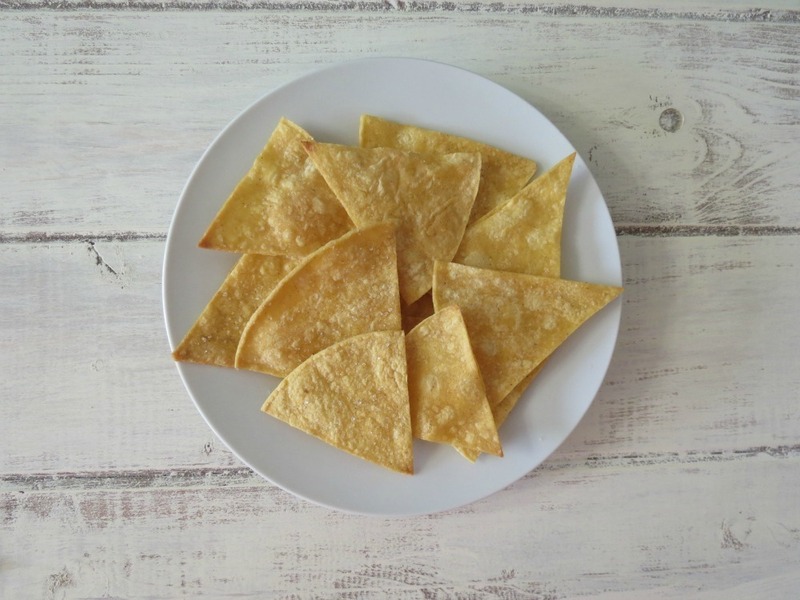 I never thought of making my own tortilla chips using low carb high fibre tortillas. Love this idea. Thanks for sharing. I know what you mean about the calories! 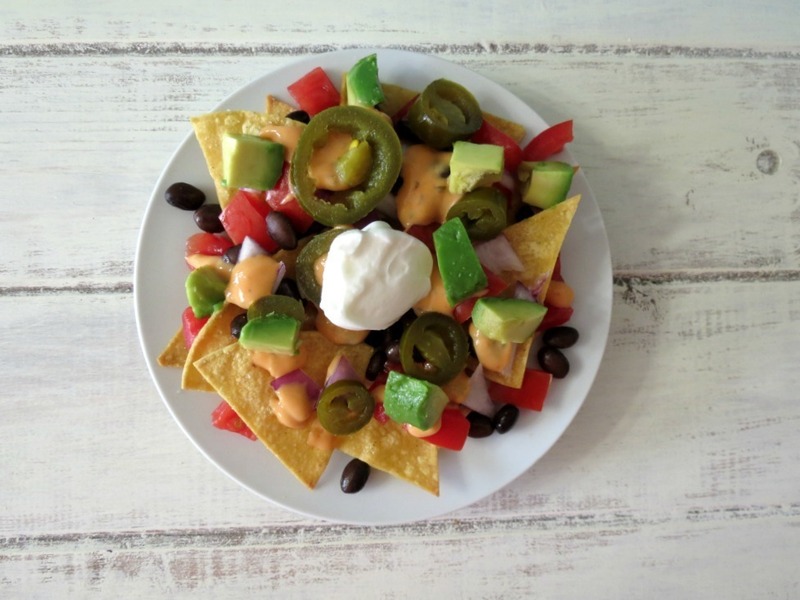 I love nachos, so when I crave them, I make them at home, the calories are crazy at restaurants! I love Mission tortillas too! I have made shells out of the flour tortillas, I love them that way! Delicious!! Most importantly very easy!! I agree! I like easy and quick meals or snacks! Why did I not realize that Trader Joe’s made Queso? My husband is addicted to cheese dip but I cringe at the ingredients list. I wonder if TJ’s version has fewer additives? Usually, I put far more trust in TJ’s than Tostitos. I ran out of my cheese dip, so I can’t check what it is made out of. Hmmmm, I think I’ll get more tomorrow and see. 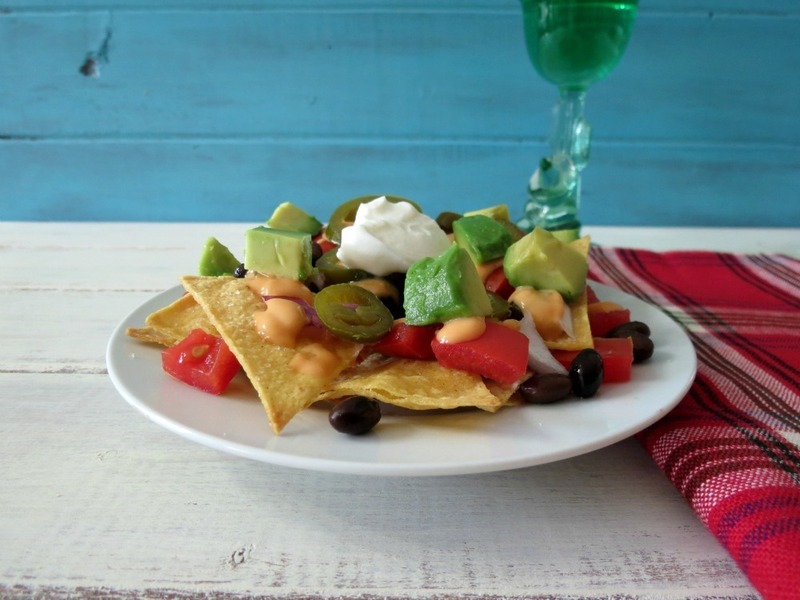 Great ideas on how to make healthier nachos! Never thought to just bake a tortilla! I also never tried the Trader Joe’s Queso dip. Seriously could Trader Joe’s be an more awesome?! You have to try TJ’s Queso dip! I love the stuff! Just look at your darling new blog!!! LOVE it! And your nachos look amazing! Ohhhh thanks Liz! I tried to clean up the blog a little bit! 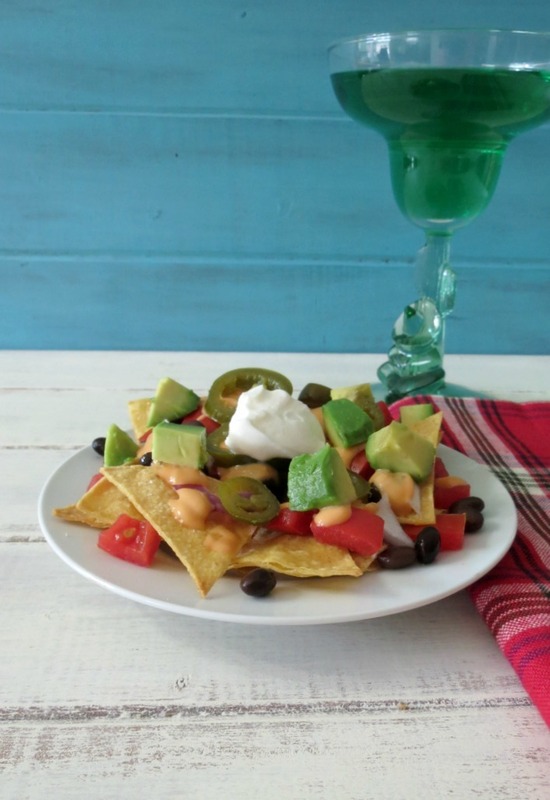 I could eat nachos everyday…all different ways! And I love your creation! Making these tonight for movie night with the kiddos! Yum!! I don’t have a trader joes though. What should I use that wont change the nutritional information? Hmmm, let me think about this one, and I’ll let you know! 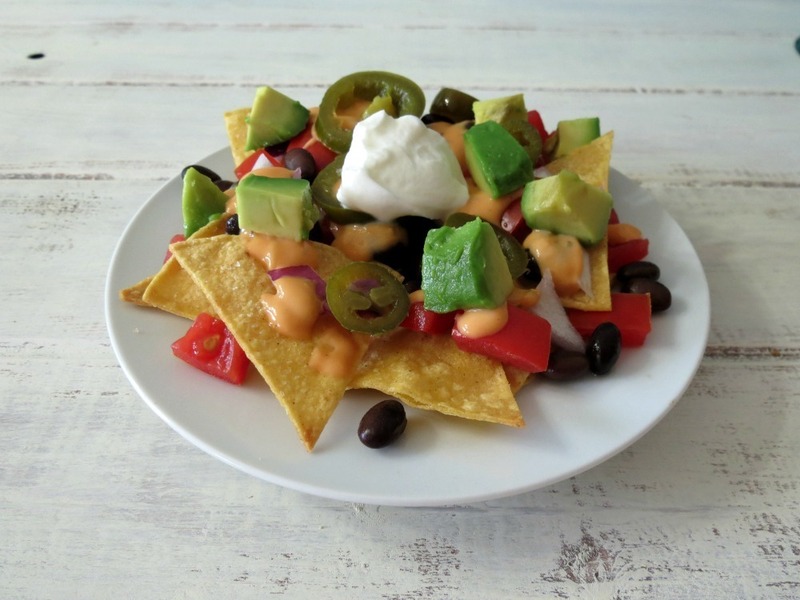 I love nachos – I usually replace the sour cream with yogurt too – no one can tell. Thanks so much for linking up to Friday Food Frenzy! I love to sub yogurt for sour cream I everything, it’s crazy because no one notices. Thanks for having me on Friday Food Frenzy! Happy friday! We should definitely start to celebrate friday evening, hahaha. Very good tip, I also love nachos and baking tortillas what a great idea, thanks for sharing, have a lovely weekend!